Attending St. John’s College, I often forget that chalkboards aren’t exactly commonplace. 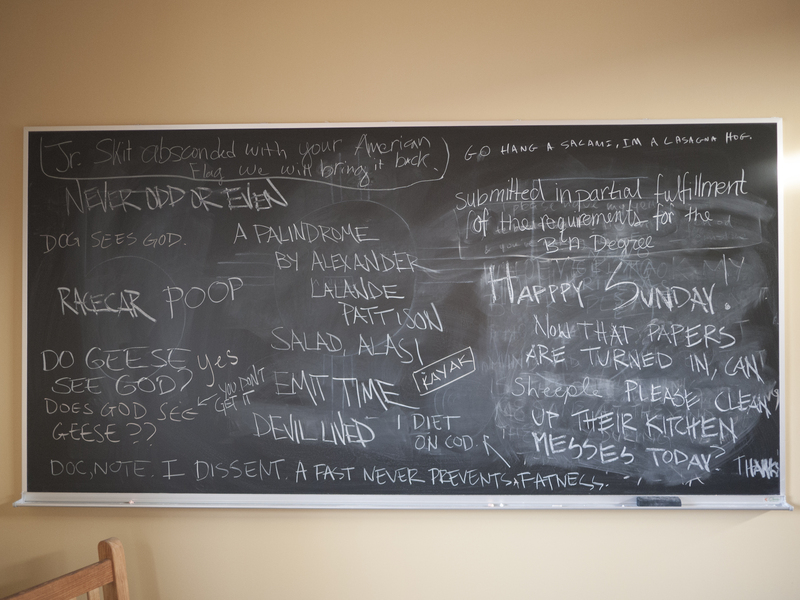 Every classroom on campus has a chalkboard (or three), the coffee shop has chalkboards, the commons have chalkboards, the dorms have chalkboards – come to think of it, I’m not sure of a place on campus where there isn’t one. They’re used most often to perform demonstrations for math, but language classes will often use them as well to write out translations, and lab classes will use them to record data or draw out schematics. But that doesn’t mean we never have fun with them either. Lately, the chalkboard in our dorm has been host to a sort of palindrome contest. My favorite is still, “Salad, Alas!”.